I have always found it quite amusing that the real-life “Faithless Street” — one of the actual places where Ryan Adams lived in Raleigh during Whiskeytown’s early days, where events transpired that would turn up in songs on the band’s 1996 full-length debut Faithless Street — was actually right next to a place literally called Hope. Back then, he was living in the neighborhood adjacent to NC State University; an old rental house located on Logan Court, at the corner of Logan and Hope Street, just off the Hillsborough Street strip and about a block away from Sadlack’s. Opinions shouldn’t be static or carved in stone, and two decades past Whiskeytown’s prime I do sometimes catch myself wondering: Were they really all that? And pretty much every time, something will cross my field of vision that feels like the universe answering back with a reminder: Um, yeah. For example, there’s a vintage video that surfaced a few days ago, posted by Michael Niebuhr — the superfan behind the very fine and almost comprehensive archival Ryan Adams fan site Come Pick Me Up. This video is from a Whiskeytown show that captures an optimistic moment in time, the St. Louis date of the “No Depression Tour” sponsored by the magazine; April 5, 1997, and it’s kind of an only-in-St.-Louis artifact right down to Ryan’s nasty set-opening shout-out to Post-Dispatch critic Chris Dickinson over an unflattering Uncle Tupelo comparison (plus the onstage dancing cameo by Beatle Bob). This is from the period that is pretty much the heart of “Losering,” shot when Whiskeytown’s major-label debut Strangers Almanac was recorded but not yet released. And even though Strangers wouldn’t be out for another three months, Ryan already seemed to be getting a little bored with it; that night’s set included just three Strangers songs to go with two from 1996’s Faithless Street, plus a cover of Iggy and the Stooges’ “I Wanna Be Your Dog” and three “lost” songs that I don’t believe ever turned up on any other album before or since. The audio quality isn’t great, and there’s not a lot of variety to the visuals. Nevertheless, you still get the idea of what a wonderfully shambolic mess of ragged glory the Whiskeytown live experience could be back then. I do, anyway. Your mileage may vary, but seeing this made my tired old heart go pitter-pat. 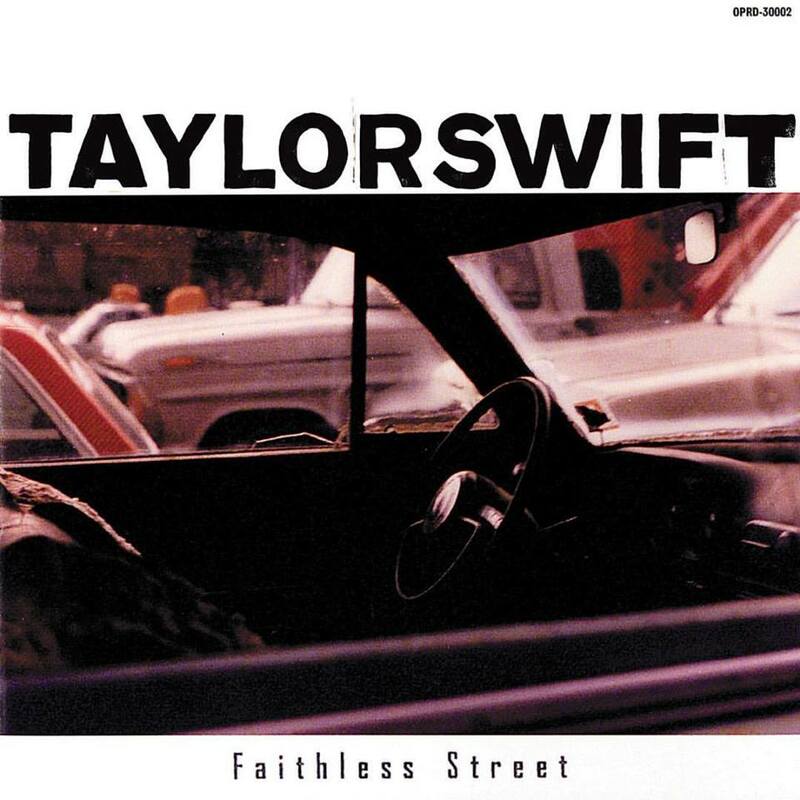 Yesterday, Ryan Adams’ long-ago bandmate Skillet Gilmore posted on Facebook that he and Caitlin Cary were “assuming that Taylor Swift is holed up right now learning all of Faithless Street” — and it’s definitely hilarious to imagine Swift returning Ryan’s 1989 favor by recording Whiskeytown’s ragged-but-right 1996 alt-country classic as immaculate pop. But this morning, Skillet took it to the next level by posting the picture below on Instagram, with shout-outs to @misterryanadams and @taylorswift. Come on, Taylor, make this wildest dream come true! Phil Wandscher might appreciate it, too! Speaking of folks with closets-full of Whiskeytown artifacts, Thomas O’Keefe’s latest eBay auction lot consists of a dozen items circa 1997-98, including a page of handwritten lyrics; an original copy of the “Theme for a Trucker” seven-inch vinyl single; and assorted pieces of tour and promotional paraphernalia connected to Whiskeytown’s time on Outpost Records. The lyrics, from a Forever Valentine-vintage song called “House for Sale,” probably have the most historical significance. But what caught my eye was this canceled check for $150, which Ryan Adams started to write to pay for his power bill before scratching that out and writing it for his phone bill. This is a snapshot of a moment in time, and not just because “Bell South,” “CP&L” and “Wachovia” were all swallowed up by other corporations long ago. The July 30, 1997 date is one day after Whiskeytown’s Strangers Almanac album was released. It’s also a document of a place. I always thought of the Logan Court address printed on this check — in Raleigh’s University Park neighborhood west of Sadlack’s and north of the Hillsborough Street strip right behind Bruegger’s Bagels, at the intersection of Logan, Chamberlain and (ha) Hope streets — as the real-life Faithless Street, the setting for that time period’s songs. I lived just a few blocks away back then and remember going by his house a time or two, including one quite memorable afternoon in the spring of 1996 when he played me a bunch of demo recordings of excellent new songs that I don’t think ever came out (that’s in chapter six of “Losering”). Meanwhile, bidding for this lot currently stands at $100 and closes on the afternoon of Thursday, March 12. UPDATE (3/12/2015): The winning bid, $445. 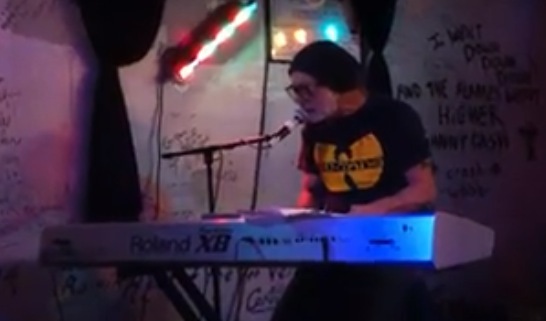 When we did the first “Losering” tribute show back in May 2013, singer/songwriter Jeff Mullins didn’t just play, he also filmed all of that night’s performances for posterity. And he’s gone back and edited them in anticipation of the upcoming “Losering 2: The Songs of Ryan Adams” (happening April 11 at Deep South the Bar in beautiful downtown Raleigh). Here’s the first clip, in which Ryan “Showtime” Kennemur throws down a right nice version of the Faithless Street track “If He Can’t Have You.” Check it out, along with the rest of the playlist from that night here — and get tickets soon for “Losering 2,” because it will probably sell out again. Just in time for the holidays, here’s another super-cool Whiskeytown token that might be even rarer than the old Strangers Almanac whiskey bottles — Whiskeytown Beer, the entire 120-bottle run of which might already be sold out by the time you read this. It’s the work of Chapel Hill’s Starpoint Brewing, brewed by Tim Harper and Chris Baker. And if the name Tim Harper rings a bell, it should. Long before he ever started brewing beer, Tim was an old studio hand in North Carolina for a couple of decades. Whiskeytown figures prominently on his resume. Tim engineered and Chris Stamey produced the 1996 “Baseball Park Sessions” that got Whiskeytown its deal with Outpost Records, and those two also oversaw the remix of Whiskeytown’s Faithless Street album that was reissued in 1998. The road to Whiskeytown Beer started a few months back when Baker come up with a beer recipe involving whiskey, wood, chocolate and coffee, and enlisted Harper to brew it at at his brewery. First came the beer, then came the name. 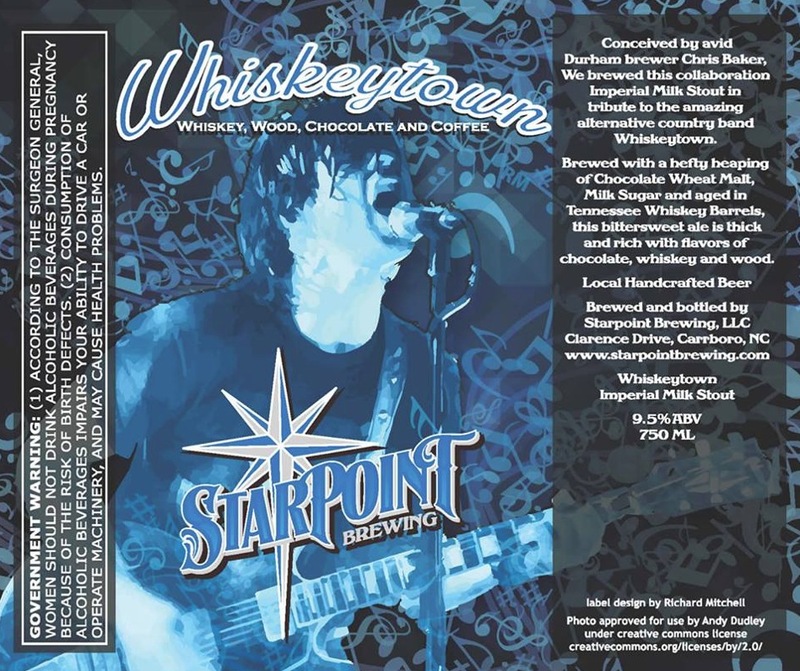 Before printing up the label, Tim got approval from multiple sources in Whiskeytown’s orbit, including the photographer who took the picture of Ryan (also seen on Whiskeytown’s Wikipedia entry), Caitlin Cary, Skillet Gilmore, lawyer Josh Grier — and yes, Ryan himself. Once he was done brewing, Tim bottled 10 cases to sell and put the rest into draft kegs. Those 120 bottles are going fast, but fear not: More is on the way. When I was interviewing folks for “Losering” a few years back, one of the people I tried but failed to track down was pedal steel player Bob Ricker, who did some stellar work on Whiskeytown’s full-length debut Faithless Street (in fact, I wrote that he was that album’s “unsung hero”). He’d been gone from Raleigh for more than a decade by then, and I asked around; but nobody I queried seemed to know where to reach him, so I had to move on. Fortuitously, however, I heard from Bob recently after he read the book, and we chatted a bit about the old days. 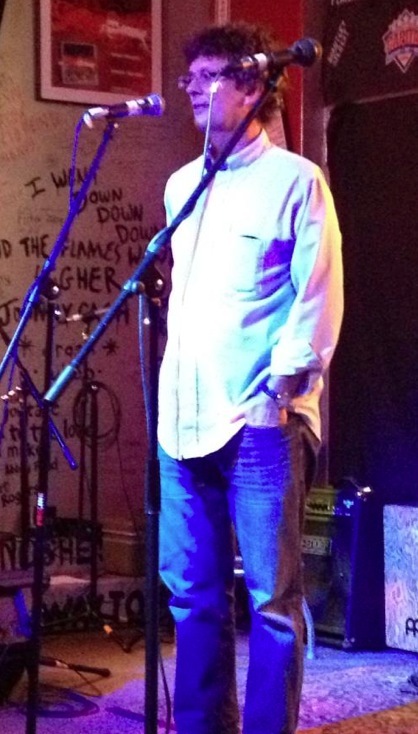 Now 57, Bob has been in Nashville since 2000, working as a telecommunications consultant when he isn’t playing and producing music. 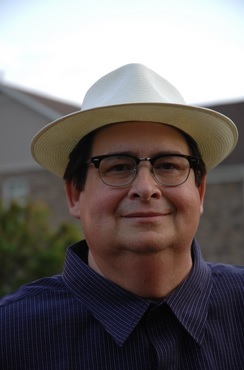 But the early ’90s found Bob living in Raleigh while working in Nortel’s Research Triangle Park plant by day, and playing pedal steel guitar around town by night. At a bookstore in Raleigh one evening, Bob met local musician Jeff Hart — the same Jeff Hart who was ringleader of the 1995 show where I first interviewed Ryan Adams, as recounted in the “Losering” preface — who introduced him to some key people in the scene. Bob played a few shows with the earliest version of Chip Robinson’s Backsliders before falling in with Whiskeytown in 1995, one of a series of pedal-steel players who passed through the lineup as Ryan Adams tried to countrify the sound. Although he was nearly 20 years older than the rest of Whiskeytown, Bob fit in well enough. Bob also remembers Ryan coming out to his house to work on songs, and his wife’s reaction when he told her “this kid had it” — “Are you kidding?” But her skepticism ended as soon as she heard them playing together. Bob actually has tapes of some of what they worked on, which I would dearly love to hear. Someday, I hope! Alas, Bob’s job at Nortel involved enough out-of-town travel that he had difficulty being around for Whiskeytown’s gigs. After the Faithless Street sessions, he stayed through the fall of 1995 (he was onstage at that October’s infamous Berkeley Cafe show where Ryan and Phil teamed up to destroy Ryan’s guitar), but had to bow out before the early-1996 release of Faithless Street. 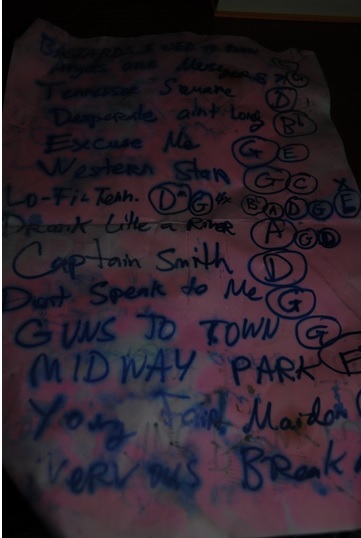 He recently found an old circa-1995 setlist from a Whiskeytown show at the Brewery in a road case, which is on the left. Going on two decades later, he still gets asked about Ryan with some frequency. Back in Whiskeytown’s prime, I really wanted them to break through to widespread popularity, which seems a bit odd in retrospect. Sure, it would have been fun to watch from close range; but I can’t say why I was rooting for them beyond a vague belief that a large audience was going to provide some measure of validation. There was closure that only a large crowd singing along with “Sixteen Days” was going to provide. Fittingly and belatedly, that happened last night, sort of. 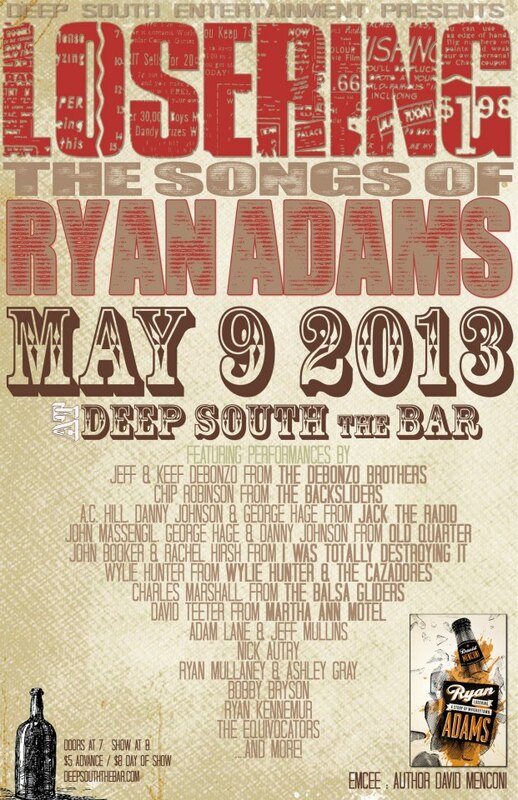 The fine folks at Deep South The Bar in Raleigh put together a tribute show inspired by my book, “Losering: The Songs of Ryan Adams,” and I got to emcee. And about halfway through the show, while members of the band Old Quarter were playing “Sixteen Days” — the song I thought was going to be Whiskeytown’s big breakout hit way back in 1997 — I was hollering along with everyone else in the soldout house and feeling chills about the experience. Aaron Menconi, shortly before asking why he started that damn country band. David Teeter (from the band Martha Ann Motel) — He brought out a couple of more recent Ryan solo songs, “Shadowlands” and “Desire.” And to make the absent guest of honor seem more present, David also played the recording of the infamous Jim DeRogatis voicemail, a legendary moment in artist-critic relations. Guffaws all around. Ryan Kennemur — Continuing in a humorous vein, Ryan gave a nod to Mr. Adams’ touchier side by belting out a bit of Bryan Adams’ “Summer of ’69.” Then he got down to business, and his versions of “Turn Around,” “Avenues” and especially “If He Can’t Have You” were outstanding. John Booker and Rachel Hirsh (I Was Totally Destroying It) — Major props go to John, who did a fantastic job with booking the acts for this show. And he and his bandmate Rachel did great with four songs — “Everybody Knows,” “Call Me On Your Way Back Home,” “Don’t Be Sad” and “Firecracker.” There was an enthusiastic audience sing-along on the latter song, and John needled me a bit for not giving it and the rest of Ryan’s Gold album sufficient respect in the book. Touche! Danny Johnson, who plays in about a thousand other bands, sat in. Bobby Bryson — I’d never heard Bobby before, and he might have played my favorite set of the night with stellar versions of “A Kiss Before I Go,” “Let It Ride” (also much audience singing along here) and “Carolina Rain.” He showed absolute command instrumentally as well as vocally, and I loved his stage presence. Afterward, he presented me with a business card carrying the slogan Songs that gently rip your heart out. I believe it. Charles Marshall and Richard Bolton (Balsa Gliders) — They put a couple of Strangers Almanac-era Whiskeytown classics through some unusual paces, quieting down “Waiting to Derail” and rocking up “Avenues.” Very cool, inventive versions that they clearly put some thought into. John Massengil, George Hage and Danny Johnson (Old Quarter) — The aforementioned “Sixteen Days” sing-along went over great. So did “Jacksonville Skyline” and a lovely reading of “Houses on the Hill.” Meg Johnson sat in on vocals (and also with Jack the Radio). Felt like being at the Brewery back in the day. Jack the Radio — Speaking of sing-alongs, there was a raucous one on “Come Pick Me Up,” maybe the most exuberant of the night. “O My Sweet Carolina” and “Lucky Now” rounded it out. Adam Lane and Jeff Mullins — Ryan Kennemur returned for an exceptionally sweet harmony vocal on “Desperate Ain’t Lonely” (which they rehearsed once, outside in the parking lot, and Ryan had to read the lyrics off his phone — perfect). They also offered up a couple of nice rarities, “Onslow County” and “Oh My Sweet Valentine,” which never fails to put a lump in my throat. Last night was no exception. Ryan Mullaney and Ashley Gray — Two fine singers teamed up to harmonize on “Desire” and the Gold standard “When the Stars Go Blue” (take that, Tim McGraw). Wylie Hunter (Wylie Hunter & the Cazadores) — Back to Whiskeytown days with “Dancing With the Women at the Bar,” and Heartbreaker‘s “Be My Winding Wheel.” Really glad to hear both. Chip Robinson (Backsliders) — He sat at the piano and covered “New York, New York,” reading lyrics he’d scribbled out by hand. Fascinating, weird and pretty great, made even moreso because he was wearing a Wu-Tang Clan T-shirt. I snagged the hand-written lyrics for my archive. Be The Moon — And in the closing slot, this trio from Burlington offered up the resurrected Whiskeytown song “Am I Unstable.” It was fantastic, featuring box drum and an arrangement that Peter Blackstock’s memory placed in the ballpark of the original (which Whiskeytown only played live once, nearly 13 years ago). 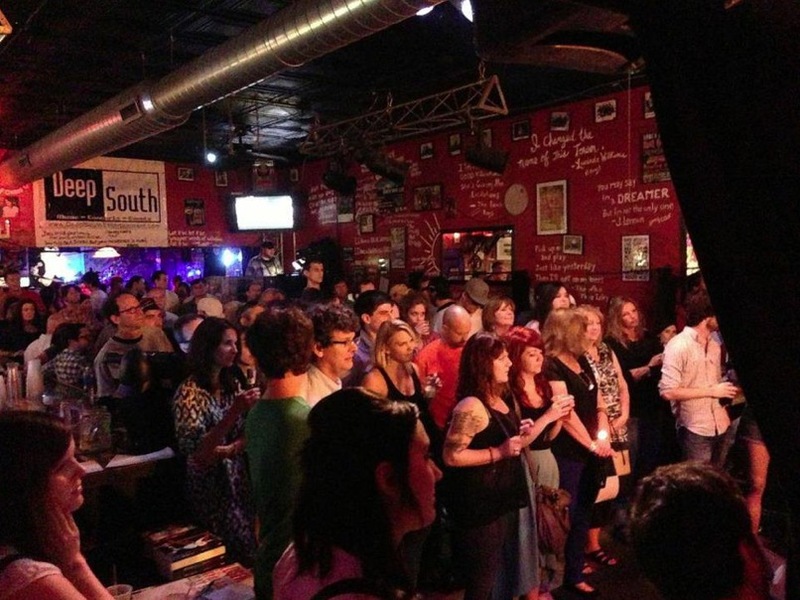 All told, the event raised $579 for the Future of Music Coalition. I could not be happier, and prouder of everyone involved. Thanks to all the musicians, and especially to Deep South impressario Dave Rose for making it happen. Raleigh is abuzz this weekend with baseball fever, which is at its most feverish local pitch in years thanks to a high-profile three-game series between the visiting University of North Carolina Tar Heels and the North Carolina State Wolfpack. Both teams are ranked in the national top-10 — UNC at No. 1, State at No. 6 — and Friday night’s opening game went about how you’d expect based on their relative rankings. Two more games await, and Saturday’s first pitch is at 6:30 p.m. But for our purposes here, we’re more interested in the setting than the teams or the games — NC State’s Doak Field, which is by the train tracks just off Raleigh’s Hillsborough Street strip. It’s a setting that helped inspire one of Ryan Adams’ choicer obscurities, “Empty Baseball Park,” a lovely little mood piece of a song that emerged in the wake of Whiskeytown’s 1996 full-length debut Faithless Street. I heard Whiskeytown play “Empty Baseball Park” a few times live that year, and it was among the handful of songs recorded as pre-Strangers Almanac demos from the “Baseball Park Sessions.” But it didn’t make it onto Strangers Almanac, eventually emerging as one of the extra bonus tracks on the 1998 Faithless Street reissue. I’ve always liked “Empty Baseball Park,” which is steeped in a sense of townie ennui that would have fit right onto Strangers (see Chapter 8 of “Losering” for more on that). 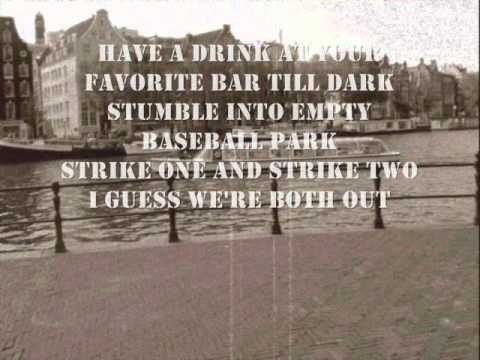 Over an easy-gliding arrangement, the lyrics tell of drinking at a favorite bar until dark before stumbling on down to the empty ballpark, pretending to heckle a non-existent game, continuing on past the record store (maybe Schoolkids?) and on to the movies (maybe the small underground indie-movie house that used to be near the old Schoolkids space on Hillsborough Street? ), trying to think of something else to do. The conclusion: “Nothing’s comin’ to me.” I bet it was at least the partial inspiration for this twisted little piece of genius. SECOND ADDENDUM (5/26/13): The rubber match happened in the ACC Tournament, and it was one for the ages — UNC edging NC State 2-1 in 18 innings. Wow!